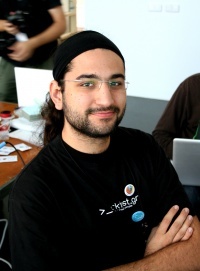 I am an active contributor in some major Foss projects mainly in Fedora Project where I am an Ambassador, Head of Greek Localizing team and member of Marketing Team. Now I am actively working on the Development and Deployment of the Mozilla Reps program. Don't hesitate to write me a line (or many more) of suggestions, ideas or just hello! Using "identi.ca" as property chain is not permitted during the annotation process. This page was last modified on 26 July 2013, at 21:38.